IMPORTANT NOTICE: January 2015, to all users of BEBIG Plaque Simulator version 5 and earlier versions (PS5). PS5 is now 21 years old and has reached end-of-life as a sustainable product. The computers for which it was designed (Apple Macs with PowerPC processors) were phased out by Apple in 2005, the last operating system that supported software emulation of the PowerPC processor was OSX 10.6 which was released in 2009. Plaque Simulator version 6 (PS6) has been in development and testing since 2012 by Eye Physics, LLC and is now available to replace PS5. PS6 is designed for recent Apple Macintosh computers with Intel Xeon or Core i7 multicore processors. PS6 leverages multiple cores to accelerate dosimetry calculations by distributing the work uniformly and concurrently amongst all available logical cores. Please visit the Plaque Simulator page for details. Hardware recommendations are discussed in the PS6 User Guide. New: A 10 minute Video Synopsis of image guided 3D conformal treatment planning, placement of the plaque using surgical coordinate guidance, and subsequent removal of the plaque at the conclusion of treatment. These new plaques will be available in dozens of preconfigured as well as fully customizable sizes, shapes, curvatures and source arrangements. Our plaques are less than 2 mm thick, the radionuclide sources are individually collimated to conform the resulting dose distribution to the tumor, spare the surrounding retina, and provide a close fit to each patient's eye size and shape and to the tumor height and location. The Plaque Simulator software provides image based 3D modeling of each patient's eye and tumor, the plaques, and precise calculation of suture coordinates for the surgeon. 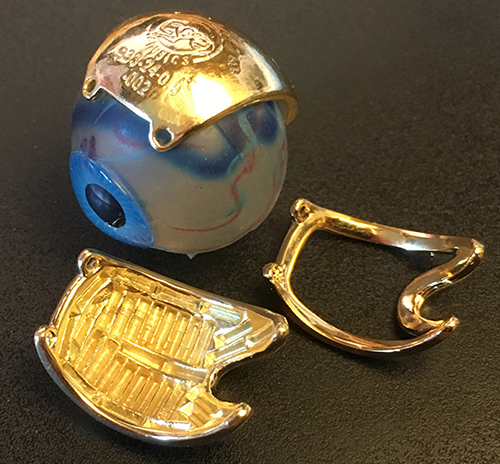 Latest blue castable resin prototypes including sprue and on the convex side of the plaque the Eye Physics logo, model number, and serial number. 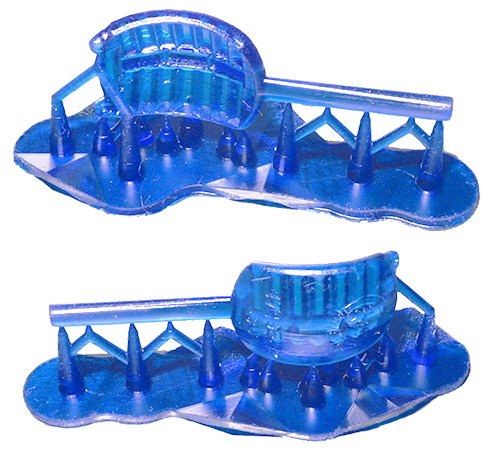 These were created using our new in-house FormLabs stereolithography 3D printer. 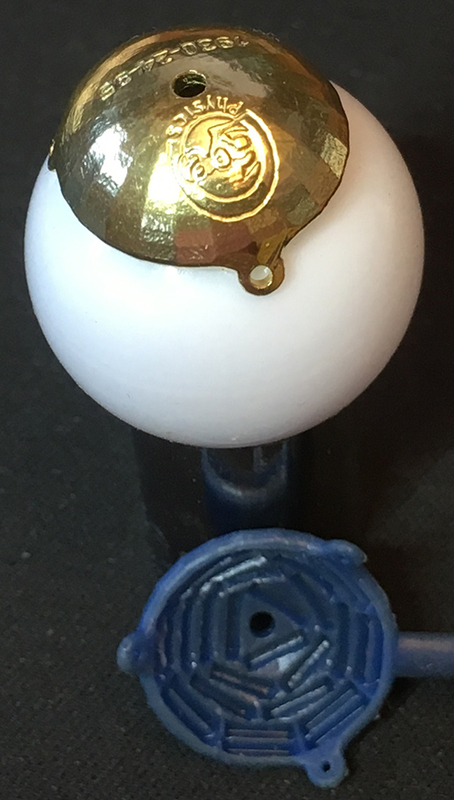 Eye Physics newest 3D printed plaque, the EP2028 is designed for treating tumors located in the anterior hemisphere of the eye. It is a slighly smaller version of the recently introduced 2335 and 2339 shown below. Eye Physics recent 3D printed plaque, the EP933, replaces the older manually prototyped EP930. The 933 designed for treating large peripapilary tumors that wrap around the optic disc. It features a deep notch and slots for up to 3 seeds on each side of the notch. 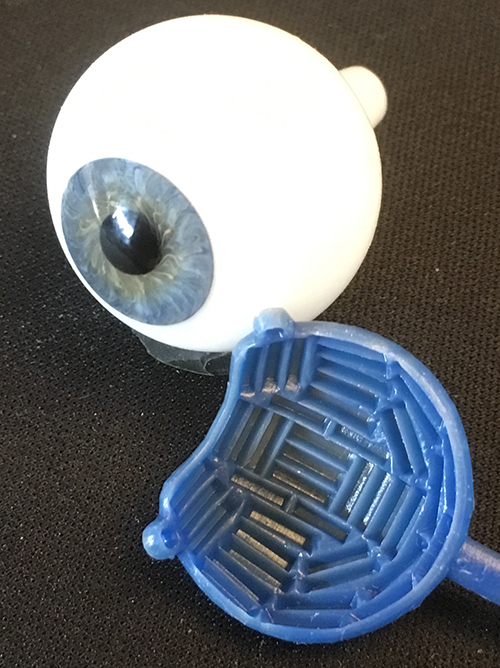 Eye Physics recent 3D printed plaques, the EP2335 and EP2339 lines are designed for treating tumors located in the anterior hemisphere (e.g. ciliary body tumors) of the eye. The plaques pictured were shaped for conformal fit to eyes of about 24mm equatorial diameter with slightly oblate anterior hemispheres. Next in the production pipeline is the EP2343, an even larger version of the 2028, 2335 and 2339 family for large and anterior tumors. 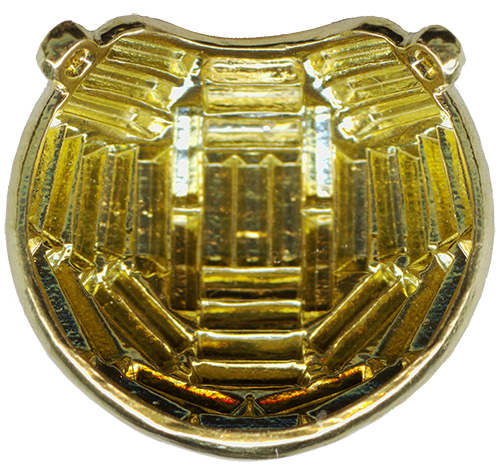 The first 18K gold casting of the 2343 received Aug. 2, 2017. Suture templates should be ready by September 2017. 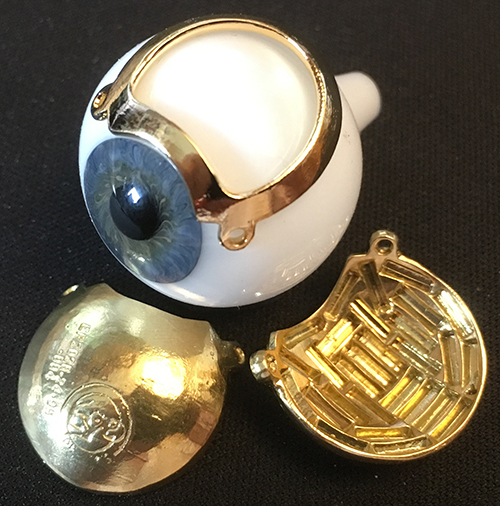 The EP1930 is a new experimental dome shaped plaque designed to arc above the cornea to treat tumors of the iris. 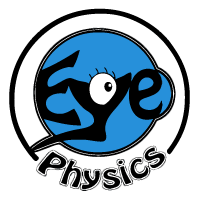 Eye Physics, LLC is a Medical Physics Consulting and Services Company. The company is led by Emeritus Prof. Melvin Astrahan, PhD, DABR. 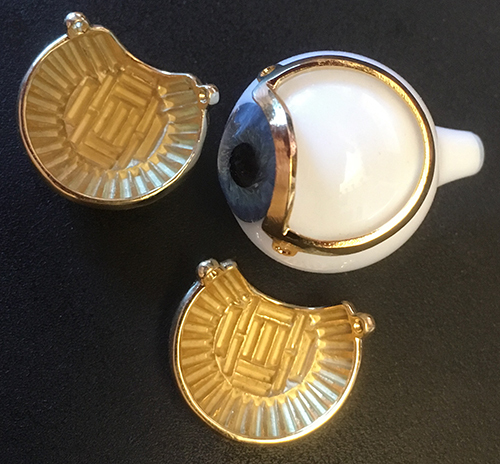 NOTICE: Eye Physics plaques are not yet FDA approved (we're working towards getting clarification). then again, neither are any other eye plaques as far as we know... however, eye plaques and their related accessories and planning programs may be exempt from premarket notification procedures according to this section of Title 21: Sec. 892.5650 Manual radionuclide applicator system. You can download our shareware and freeware software products using the links in the left column of this web site.